Mastercard has abandoned its 'goals-for-meals' campaign with football stars Lionel Messi and Neymar Jr. after it faced fierce criticism. The company has instead promised to contribute two million meals in 2018 as part of its work with the United Nations World Food Programme (WFP). The controversial campaign saw Mastercard pledge to donate 10,000 meals to children in Latin America and the Caribbean every time Messi or Neymar score until 2020. Promoted on Mastercard’s Twitter account for the Latin America and Caribbean regions, the campaign faced a backlash, with several commentators saying it was in poor taste. The Times chief football writer Henry Winter accused Mastercard of "turning the World Cup into the hunger games". compassion should never be a competition. it should be an instinct. and what does that say to Messi and Neymar? if you miss a goal, people starve. It's a crass campaign anyway. In a statement issued today, Mastercard said the campaign would no longer be running. 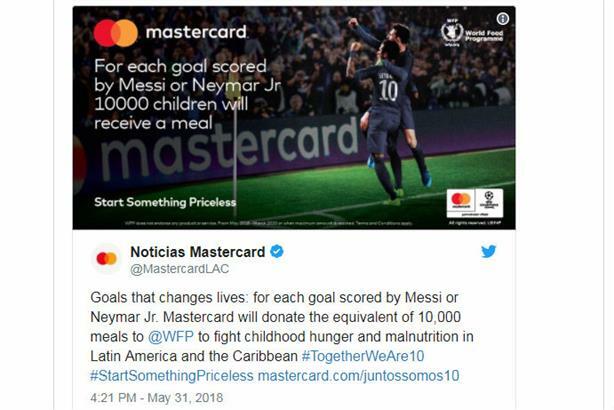 "Mastercard has heard the comments about our campaign in Latin America featuring our brand ambassadors Messi and Neymar Jr. in support of the United Nations World Food Programme (WFP)," the statement said. "We don't want fans, players or anyone to lose focus on the critical issue of hunger and our efforts to raise support for this cause. Based on the feedback, we are adjusting this campaign to replace the 10,000 meals donation per goal by Messi and Neymar Jr. with a contribution of two million meals in 2018. "This is in addition to 400K meals we have already donated as part of the campaign. We want to reinforce that Mastercard’s global commitment of delivering 100 million meals by the end of this year goes beyond any one campaign. We are grateful to our brand ambassadors who will continue to play a critical role in helping us raise awareness of the cause. Mastercard will continue to be one of the many players engaged in reversing the cycle of poverty globally." Mastercard also provided a statement from the WFP, which said: "The United Nations World Food Programme is a voluntarily funded organisation and depends of the generosity of governments, companies and members of the public to fund its life-saving work. Last year, we provided food assistance to over 90 million people but with more help, we could reach many millions more. Mastercard is a valued partner of the World Food Programme and over the past five years has driven a multi-million dollar investment in the agency’s life-saving work." The campaign was launched less than two weeks before the start of the World Cup, although it did not reference the tournament as Mastercard is not a sponsor – it is a long-time sponsor of the UEFA Champions League, however.